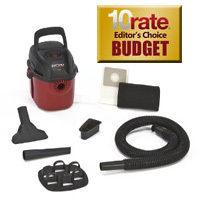 If you’re looking for a small, no-fuss wet/dry vacuum, then the Shop-Vac 2021000 is a perfect choice. It does what it advertises: cleans up spills and crumbs easily and efficiently. It comes with a wall mount so you can store it off the floor in a garage or laundry room. The tools also fit on a separate wall mount bracket so they’re out of the way until you need them. We liked the fold-down handle on the top, which makes it easy for carrying this vacuum around. The hose and power cord could be longer, but this is a micro vac so it’s understandable that everything will be a little smaller. The power is surprisingly good for a small machine.